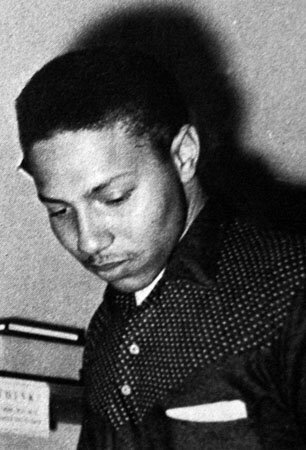 It was at the colossal, stupendous, incredible Meters show in Manhattan on Friday (more on THAT later on...), that I knew that today's B side post would attempt to pay tribute to the one and only "Poppa Funk" - Art Neville. While still in High School, Art's band "The Hawketts" recorded a song at the WWEZ studios for disk jockey Ken Elliot, aka "Jack the Cat". Cut in one take, "Mardi Gras Mambo" was leased to Chess and became THE Carnival record of 1954. Alongside Professor Longhair's "Go To The Mardi Gras", it has become one of New Orleans' most enduring anthems. The Hawketts became the hottest group in town, playing everywhere from High School proms to backing up Larry Williams on his swings through the South. Oddly enough, Chess would never record them again. It was Harold Battiste, then working as A&R man for Specialty Records, who brought Art back into the studio in 1956. 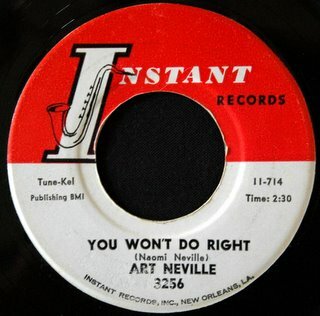 The resulting single, Oooh-Whee-Baby took off, and for the next year or so Neville was criss-crossing the country playing in rock & roll package shows with the likes of Lloyd Price and Little Richard. In 1958 Specialty released "Zing-Zing", backed with something called "Cha-Dooky-Doo". It was the B side that would become the hit, with its groundbreaking distorted guitar sound (which actually was the result of guitarist Irving Charles' blown amp!). Art, meanwhile, had been drafted into the Navy, and first heard the record on the radio while suffering and shivering his way through boot camp up in Illinois. While he was in the service, Specialty Records essentially gave up on New Orleans music and sold Art's contract to Joe Banashak's Instant label in 1961. It was here that he would do his first work with Allen Toussaint. It was his second single for Instant, the timeless Toussaint composition "All These Things", that became a huge local hit in 1962 (watching Art perform it with Toussaint backing him on the piano at the Katrina Benefit thing from Madison Square Garden this past September gave me chills!). After the breakup of The Meters in the late seventies, Art Neville gathered the family together and started The Neville Brothers. They would go on to become New Orleans' most recognized ambassadors of da groove, not only closing out Jazz Fest most years, but touring world-wide just funkin' it up! 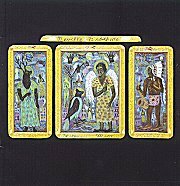 In 1989 their critically acclaimed album Yellow Moon (produced by Daniel Lanois) propelled them to the next level (It seemed for a time there that you couldn't turn on the radio without hearing brother Aaron singing a duet with somebody or other...). Meanwhile, Art was getting back to his funk roots, forming The Funky Meters (as close as he could get to the real deal without Zigaboo on the skins) as a side project, reaching a whole new generation of "jam band" types with his music. 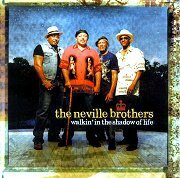 The Neville Brothers released a series of uneven albums for a variety of labels during the nineties and, soon after the release of Valence Street in 1999, found themselves without a record contract. They were basically supporting themselves by playing lucrative corporate gigs but, after 9/11, even those began to dry up. Late in 2001, Art Neville had serious back surgery that somehow went wrong. Muscles and nerves were damaged. He almost died. The doctors told him he would never walk again. They didn't know Poppa Funk well enough. Not only is he walking (although "kinda funny" as he puts it), but he's realized a lifelong dream in opening his own recording studio, "Neville-Neville Land", in New Orleans with his family. Their excellent 2004 album Walkin' In The Shadow Of Life was recorded there, and critics are calling it their best record since Yellow Moon. The most incredible thing he's done, though, is to bring the original Meters back together! After years of arguments and back-biting, the good finally outweighed the bad. It was time. As I said, I saw them perform Friday night at the Nokia Theater in NYC. GREAT GOOGLEY-MOOGLEY!!! I mean, I really can't find enough superlatives to convey to you how truly awesome they were! This was no old-timer's day reunion, this was a vibrant, happening band - even better than what I remembered from 29 years ago! each individual musician is, obviously, a master of his instrument, but it's the SYNERGY, the "sum of the parts" thing that just blows me away! They are talkin' to each other, they are listenin' again, they are actually having a great time doing it! YEAH YOU RITE!! 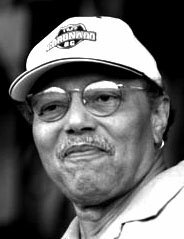 Art Neville will turn 68 next month. Yeah, Red. Art deserves props for his many years as a solo artist, prior to the Meters (glad you got to see 'em live). Nice job. I don't have the 45, but have the sides on different CD comps. This is the cooler of the two. ...the REALLY amazing thing is that I actually had a 45 that neither of you two guys had!! ...did you know that "red" is also Art Neville's nickname? great track once again!! i love it! great voice (and i take it that you friendly slag off aaron's voice?)! i can't keep names in my head somtimes so naomi neville is actually toussaint, right? and if toussaint plays the piano who could have sat at the fat organ? Naomi Neville is Allen Toussaint's mother. He used her name on most of his early songwriting credits... I don't think she was related to THE Nevilles, though ya never know! could have been as for the "first commenter" and if thats a correct word is up to you! i can't tell you much about the english language :-). was it a contract hassle that toussaint used his mother's name in his early days? otherwise i don't see a reason to do it that way. and ok, Art plays the organ. dumb question actually. i thought that it could have been someone else because he got to sing. well, that's even cooler then. btw my brother Dominik loves your blog as well. so it's not only me who is really glad and delighted about your blog. you mentioned some other regional hits by Art prior to the meters time. that would make a good "blog tune" again sometime, hm? ;-). RED YOU ARE AND ALWAYS WILL BE A NATIONAL TREASURE OF BLACK CLASSIC MUSIC.I'M HONORED TO BE YOUR FRIEND. YOUR BLOG IS THE BOMB. You have an extremely kewl blog.